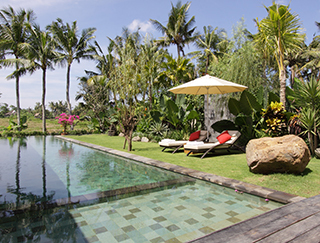 Four glorious residences – two 4-bedroom, one 3-bedroom and a 1-bedroom villa – make up the Dea Villas estate, an exclusive enclave five minutes from Berawa Beach and only 15 minutes from the buzz of Seminyak. Each is secure in its own garden with pool and outdoor pergola or balé, and enjoys shared gym, spa, and children’s playground. Each has its own character and style, from ultra-contemporary to whimsical heritage chic – enriched with hi-tech facilities including iPod docks and home theatre systems. Best of all, they can be rented separately or together, meaning Dea Villas can accommodate guests in many combinations, from a honeymooner couple to two families in adjoining villas right up to 40+ residential guests for a wedding celebration. Villa Sarasvati comprises a large living pavilion and a two-storey building arranged in an L shape around a 18m swimming pool looking onto rice terraces. 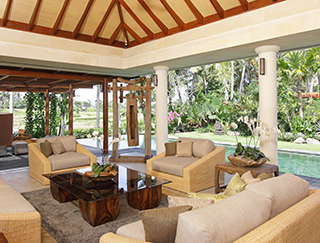 The open-plan living pavilion has a formal seating area with doors onto a covered open-sided garden room, a dining area and, across a bar counter, the guest kitchen and second service kitchen behind. In the second pavilion, which is fronted by a covered terrace on both storeys, two ground-floor master suites flank a central ‘art-gallery’ foyer leading to the main entrance. Stairs lead up to the second level where two more guest suites and a family TV room open onto the terrace. Villa Sarasvati offers four spacious bedroom suites, each with a dressing area and a light-filled bathroom that spills onto either a private garden or terrace. Each bedroom comes with an iPod dock, 32-inch TV with satellite channels and DVD player, air-conditioning, overhead fan (for the master suites), and a window seat that converts to a single bed for kids. Two ground-floor master bedroom suites feature king-size beds on reclaimed teakwood floors, huge dressing areas and equally generous garden bathrooms with twin vanities, rain shower cubicles and terrazzo bathtubs. One of the master suites has its own private garden with seating. The two second-level guest bedrooms offer the flexibility of twin beds which convert to kings, an indoor shower room and a private sun-terrace resplendent with statement bathtub for alfresco bathing.